Epcot International Food and Wine Festival is an annual event held at Epcot. This year, there are over 30 different booths set up in both World Showcase and Future World! Also during this time at Epcot, there are culinary demonstrations, mixology, beverage, and cheese seminars, and several premium events that Disney will be hosting. Located in the Festival Center will be the popular Back to Basics Seminars that are free with park admission. These seminars feature special culinary professionals sharing tips and tricks with guests to help turn standard meals into fantastic ones! 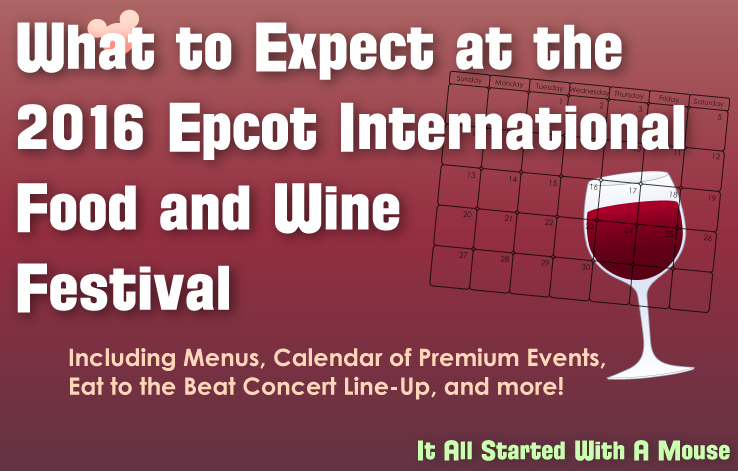 Another favorite of Food and Wine is the Eat to the Beat concert series which is held in the evenings in the American Adventure Pavilion at the America Gardens Theater. There are quite a few new booths this year joining the line-up of old favorites. New to Food and Wine this year includes: THE CHEW Collective, Chocolate Studio, Greenhouse Guru hosted by Village Farms, Islands of the Caribbean, and Wine and Dine Studio. The cost for most dishes are in the $3 – $8 range; with many of these being available for a Disney Dining Plan snack credit. The cost for wine is $2.50 – $4.75, beer $3 – $5, and mixed drinks $7 – $9. Another popular event returning to Food and Wine this year is Remy’s Ratatouille Hide & Squeak. This scavenger hunt takes you around to various locations throughout Epcot where you help Remy gather the ingredients needed for his recipe. In order to do this you need a map and stickers. You place the corresponding sticker on each location on the map to represent the ingredients. You can purchase the map and stickers for $7.95 at these locations: Disney Traders, Festival Center, Pin Central, Port of Entry, and World Traveler. Once you have completed your map, you may return it to the redemption location at Port of Entry to pick up your surprise – one of 6 special edition Ratatouille pins. Festival merchandise is available in the Festival Center which is located in the Wonders of Life Pavilion in Future World East (between Mission: SPACE and Universe of Energy). Merchandise includes special edition Dooney and Burke bags, t-shirts, hats, pins, and much more! Be sure to grab a festival map and a Marketplace Discovery Passport while you are at the Festival Center! The Passport will include menus for all booths and feature a place to get a stamp from each booth! Note: DDP denotes that items are available as 1 snack credit on the Disney Dining Plan. These free concerts are presented every evening in the America Gardens Theater in the American Adventure Pavilion. The concerts each last approximately 35 minutes and take place 3 times nightly: 5:30pm, 6:45pm, and 8:00pm. There are also Eat to the Beat Dining packages available (see below). These packages allow guests to have a meal at one of their favorite Epcot restaurants (breakfast, lunch or dinner) and a guaranteed seat at the Eat to the Beat concert that evening. The Eat to the Beat concert series is first-come-first-serve for seating, so having a reserved seat at the show is a major plus! All dining reservations must begin at least 2 and a half hours before the concert is scheduled to begin. Guests dining for breakfast and lunch have their choice of all three showtimes. Guests dining for dinner will have a choice of either one or two showtimes, depending on their reservation time. Guests using the Eat to the Beat Dining Package have their own special entrance to the America Gardens Theater and should arrive at least 15 minutes prior to the concert start time. Breakfast packages include 1 buffet, or family-style meal. Lunch and dinner packages including an appetizer, entree, dessert, and non-alcoholic beverage per person, or 1 buffet (depending on the restaurant). Eat to the Beat Dining Packages are available on the Disney Dining Plan for 2 table-service credits per person. Prices below do not include tax or gratuity. Valid Epcot admission is required. All the events listed below require an advanced ticket and have an extra cost associated with them. Keep in mind that you will also need valid Epcot admission to attend most events. To book any of the special events listed below, call 407-WDW-FEST (939-3378). Enjoy food from over 50 different tasting stations that change each night of the event. This year, guests will enjoy a new theme and entertainment each week. Guests also have the option for several different upgrades to the party. Party takes place October 1st, 8th (featuring chefs from Disney Springs), 15th (featuring Disney Chefs from Around the World), 22nd, 28th (featuring Yelloween Masquerade – guests are encouraged to wear yellow and black), 29th (featuring Yelloween Masquerade). Requires Epcot admission. Wine View Lounge – Includes private reserved table, early entrance to the event, specialty cocktail toast, premium bar, artisanal cheese station, and more. You’ll have a hands-on opportunity to learn about a plethora of different culinary topics from professionals. Subjects include mixology, cake decorating, wine pairings, and even pumpkin carving! Workshops take place daily at 4pm. Requires Epcot admission. Guests enjoy different Mediterranean dishes paired with Mediterranean wines. This event takes place September 14th, 19th, 21st, 26th, 28th, October 3rd, 5th, 10th, 12th, 17th, 19th, 26th, 31st, and November 2nd, 7th, 9th, and 14th from 1pm – 3pm. Requires Epcot admission. These special meals take place across signature dining locations throughout the Walt Disney World Resort. Join a chef as they take you through your meal; explaining menu choice, wine pairings, and cooking technique. Valid theme park admission required for restaurants located inside the parks. Prices below are per person, plus tax with gratuity included. Join an expert host as you learn about (and sample) tequila while enjoying fabulous Mexican cuisine. Lunches take place September 15th, 16th, 17th, 22nd, 23rd, 24th, 29th, 30th, October 1st, 6th, 7th, 8th, 13th, 14th, 15th, 20th, 21st, 22nd, 27th, 28th, 29th, and November 3rd, 4th, 5th, 10th, 11th, and 12th from noon – 1:30pm. Requires Epcot admission. Enjoy pairings of Wagyu beef, King Crab legs, lobster tail, and sushi prepared using naturally fermented ingredients and sauces. Tokyo Pairing takes place September 15th, 22nd, 29th, October 6th, 13th, 20th, 27th, and November 3rd, and 10th from 4:30pm – 6pm. Requires Epcot admission. Celebrity chefs and industry experts share their favorite dishes, as well as cooking tips and tricks. The event includes a plated brunch and a sparkling wine toast. During the presentation, the celebrity chef demonstrates a favorite dish and then answers questions from the audience. Brunch and demonstration takes place from 9:15am – 10:45am. Requires Epcot admission. This wine pairing event features 5 courses paired with a variety of Italian wines. The event takes places September 16th, 19th, 21st, 23rd, 26th, 28th, 30th, October 3rd, 5th, 7th, 10th, 12th, 14th, 17th, 19th, 21st, 24th, 26th, 28th, 31st, and November 2nd, 4th, 7th, 9th, and 11th from noon – 2:30pm. Requires Epcot admission. Enjoy cheese and drink pairings from different international regions while experts explain the different cheeses and their best pairings. Seminars are select Saturdays from 9:15am – 10:45am. Requires Epcot admission. Join a master sommelier or distiller for a 2 hour crash course on the nuances of Wine (September 18) or Bourbon (October 30). Requires Epcot admission. Teppan chefs showcase their incredible skills as they create cuisine from the Miyazaki Prefecture on Hibachi grills for guests. This event takes place September 20th, 27th, October 4th, 11th, 18th, 25th, and November 1st, and 8th from 4:30pm – 6:30pm. Requires Epcot admission. Go behind the scenes at Trader Sam’s and enjoy lunch and a fun mixology session! Sessions take place September 21st, 28th, and October 5th, 12th from noon – 2pm. Enjoy wines from three different regions of Morocco while enjoying tasting portions of delicious Moroccan cuisine. This event takes place September 20th, 27th, October 4th, 11th, 18th, 25th, November 1st, 8th from 3:30pm – 5:30pm. Requires Epcot admission. Guests dine on a 4 course Italian meal while enjoying Italian craft beer and wine. This event takes place September 20th, 22nd, 27th, 29th, October 4th, 6th, 11th, 13th, 18th, 20th, 25th, 27th, and November 1st, 3rd, 8th, and 10th from 1:30pm – 4pm. Requires Epcot admission. Enjoy a sampling of six different Japanese craft beers, paired with six different Japanese Pub foods. Tastings take place September 21st, 28th, October 5th, 12th, 19th, 26th, and November 2nd, and 9th from 1pm – 2pm. Requires Epcot admission. 3 course lunch which gives guests the chance to explore the “sensory-food connection.” This lunch takes place September 22nd, October 20th, and November 2nd from noon – 2pm. Guests are served authentic French pastries, a mimosa, and unlimited coffee, tea, hot chocolate, and orange juice. These breakfasts take place September 24th, October 1st, 8th, 15th, 22nd, 29th, and November 5th, and 12th from 9am – 10:30am. Requires Epcot admission. Enjoy specialty burgers and drinks while a DJ plays music by the artists who have inspired the culinary creations. Each party will feature a different celebrity chef: Maneet Chuahan will be there September 30th, Alex Seidel will be there October 14th, and Jehangir Mehta will be there November 11th. Parties will all be 7pm – 9pm. Requires Epcot admission. Nosh Pit Seating – VIP experience that includes a private reserved table, early entrance into the event, specialty cocktail toast, premium bar, and more. Enjoy Parisian finger sandwiches, petit fours, macarons, mignardises, and unlimited mimosas! This event will take place October 1st, 8th, 15th, 22nd, 29th, and November 5th and 12th from 1:30pm – 3:30pm. Requires Epcot admission. Enjoy a 5 course, 5 star meal prepared by the chefs of the Grand Floridian. Brunch takes place on October 6th from noon – 2pm. Complimentary valet parking provided. Chef Frank Brough will take you through an interactive chef’s table experience in a professional working kitchen. This experience will take place October 7th, 21st, November 3rd, and 9th from 5:30pm – 8:30pm. French chefs prepare their favorite meals from their childhood. Each meal is paired with French wine. These meals will take place October 7th, 9th, 14th, 16th, 21st, 23rd, 28th, 30th, and November 4th, 6th, 11th, and 13th from noon – 3:30pm. Requires Epcot admission.